Build your own simulator using our open-source software and hardware platform and download clinical scenarios. 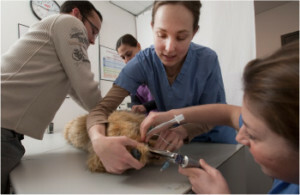 Read about and comment on commercial and DIY veterinary simulators. Share your experiences with veterinary simulators, simulation research, and the Open VetSim platform. Contact information for the VetSim team. VetSim will serve as a clearinghouse for information about veterinary educational simulation technology, and as an area where veterinary and veterinary technology educators can share and discuss their experiences with commercial and homemade simulators. It will also be the home of the Veterinary Clinical Simulation Platform (VCSP), and open-source, extensible, high fidelity immersive veterinary simulation platform.